Formats: Xbox One. Also available on the PC via Steam. Every time I started up The Escapists on Xbox One, I could hear Morgan Freeman’s voice, from his role as Red in The Shawkshank Redemption, in the back of my mind. His deep voice giving me words of enlightenment as I moved throughout the prison, planning and plotting my escape. The biggest difference between me and Red’s buddy Andy Dufresne, was that Andy escaped prison — I never did — despite my many hours and many play sessions. But I did come close! There have been a lot of comparisons between The Escapists and another game called Prison Architect. I’m not sure how valid those comparisons, having never played the latter title, but both of them both do have a top-down, retro visual style and both take place in prison. I felt that Minecraft, while it’s a bit more of a stretch is a better comparison. Especially if you enjoy Minecraft’s more carefully-paced, crafting-heavy survival mode. In Escapists, you play a prisoner — probably innocent of whatever heinous crime he/she committed, as all prisoners claim. The thing is, this “serving time” is waaaaay boring, and it’s time to fly the coop! From Day One, your goal is to escape the prison. Escaping is easy in theory, but actually doing it is a much more challenging task. You’ll have to do everything in secrecy, keep any eye on those shady inmates, and don’t make the guards suspicious. 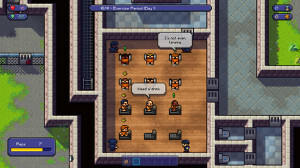 In the prison, the cast of characters consist of inmates and guards (and a couple of other NPCs). In addition to some basic player customization, like your name and look, you can also customize the other prisoners as you create a new game. Now you can be the star of your own little prison drama, staring little pixelated versions of your real-life friends and enemies. Much like The Shawshank Redemption, escaping prison requires a lot of patience and planning. You do so by collecting various items and crafting them into usable tools. There really isn’t a lot of handholding in this game, which is where I found a little frustration with it. The game’s opening tutorial walks you through an escape scenario, and provides you with the tools, but once you’re on your own, it’s up to you to figure out how to craft the tools you need, and how to keep the guards from taking them away and throwing you in solitary confinement for many days. It’s my own personal belief to NOT look at game guides — especially crafting guides — on the Internet. I tend to prefer to try and figure out the combinations on my own. However, because the possibilities are nearly limitless when trying to find the right two or three items to combine, that I DO recommend finding a web site or FAQ with the crafting combos at the ready when playing The Escapists. It might take a bit of the fun out of it, if you like to discover these things yourself, but it really allows you to focus more on the strategy of escaping, and less on wasting time and possibly getting caught and having your items confiscated. Not all items need to be crafted, or found, some of the inmates will sell you some of theirs. You earn money by working a job. The jobs you can perform are essentially mini-games that you participate in, during certain times of the day. Hit your quota during your work shift and you’ll earn some coin. If you’d rather save your money (or you don’t have any) and you’re strong enough (or daring), you can risk inmates’ friendship and take their items through excessive force by beating them up and stealing their items. If you do that, however, you’ll need to always been ready to be assaulted when that particular person is nearby. 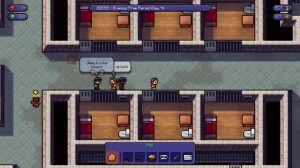 In The Escapists, your time in prison is spent on an accelerated day/night cycle in The Escapists. Your day starts at 08:00 every morning with a wake-up and roll call, where you gather with the other inmates in a central location. From there you’ll move to breakfast, then free time, lunch, your job, dinner, more free time and then one last roll-call and then lights out. At first it seemed like everything was on a set schedule that you couldn’t possibly have enough time to search for items to craft to help with your escape, but the only times you really need to be present and accounted for are the roll-calls in the morning and evening. Breakfast, lunch, and dinner exist to replenish your energy, which can also be replenished by taking a shower. You expend energy by increasing your strength and speed in the gym, or by using a computer to increase your intellect. I recommend getting buff really quickly, that way you’ll be able to take on practically any inmate or guard, without much of a struggle. I enjoyed by time in The Escapists, but like a said in the opening paragraph, I was never able to actually break free (minus the tutorial). Playing through the game on your own is enjoyable, but I definitely recommend sitting down with a strategy guide and learning some of the tips and tricks. I’m assuming that most of the tricks in the PC version also work on the Xbox One version, but don’t quote me completely on that. The Escapists will be released days from now on February 13, 2015. I recommend picking it up if you’re looking for a fun indie title to play, but check out some “Let’s Play” videos and Twitch streams, as well!